It was a beautiful Spring day in Florence, Italy. I was on my way to the Galleria degli Uffizi, one of the most fabulous art museums in the world, where I planned to spend several hours viewing breath-taking Italian Renaissance masterpieces like Botticelli‘s “Birth of Venus” and “The Annunciation” by Leonardo da Vinci. I decided to eat lunch first, and stopped at a tiny but charming café near the museum. 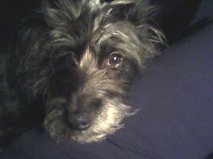 Although I was hungry, I wasn’t in the mood for pasta or anything too heavy. My waiter suggested proscuitto with melon and mozzarella. Thus, began my love affair with a traditional Italian appetizer/first course that I consider to be the perfect light lunch! It’s a classic flavor combination. There’s something about the sweet juiciness of the melon that wonderfully complements the salty porkiness of the proscuitto. Throw on some fresh mozzarella in the mix and you’ve got a dish that is insanely divine! 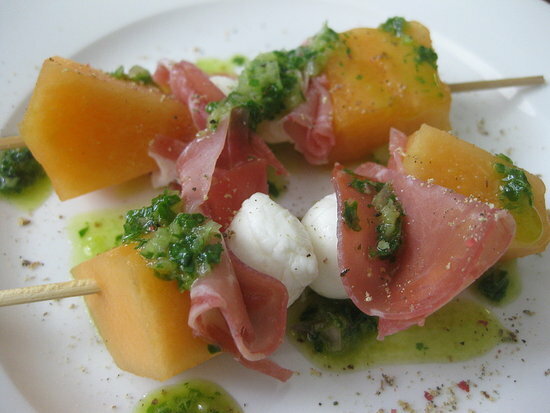 This is one of my favorite recipes for proscuitto, melon, and mozzarella. Try it with a sparkling glass of Italian Prosecco. Cut each cantaloupe wedge crosswise in half. If using large mozzarella ball, trim and cut into 6 cubes. Alternate 1 melon piece, 1 piece ruffled prosciutto, 1 mozzarella ball or cube, 1 more prosciutto piece, and 1 more melon piece on each skewer. Can be prepared 2 hours ahead; cover and refrigerate. Bring to room temperature 15 minutes before serving.